Although I love nature and the outdoors, I have become to really enjoy photography in man-made environments. When I photograph in and around my home, in Zurich, I have to make do with subjects that may not be highly attractive and interesting per se, but which I can try to capture in a way that I find more interesting than the overall scene and subject itself. Thereby, my nearby photography makes me a more conscious observer of my environment and sharpens my eye for tiny details of beauty within the city desert of concrete and glass. Searching, seeing, composing, and creating photographs of hidden, beautiful details makes me a happier person and, I believe, a better photographer. The nearby photograph shared here is very similar to the one shown recently. 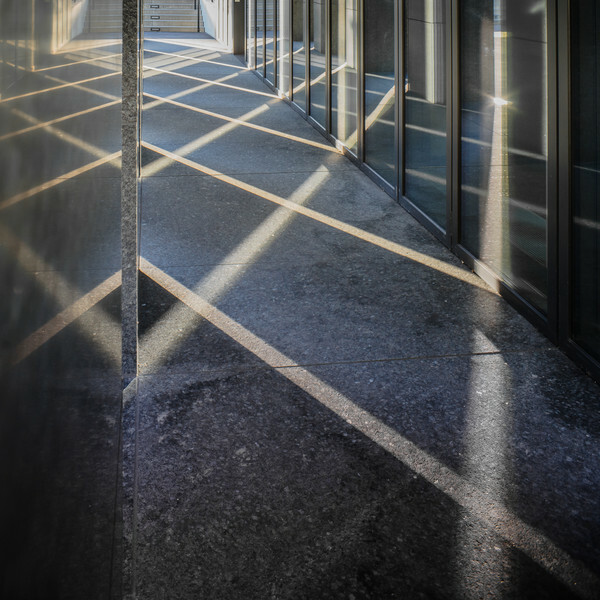 It has also been created at the skyscrapers on Hagenholzstrasse and similarly features patterns of reflections, re-reflections, and shadows. This composition also illustrates the value of returning to the same subject again and again: I have visited these buildings many times this year, under all kinds of conditions and light, and the photograph above is one of my favorites so far. This re-reflection confusion can be found in the light and shadow gallery as well as in the nearby collection.